Ernest and Sarah Lily Jones at their wedding early 1911 at Muston. They emigrated to Australia soon after. 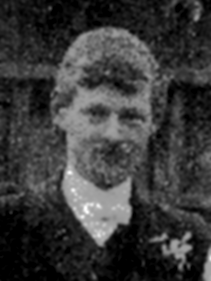 The son of James and Ellen Jones, Ernest was born in 1890 in Wilmslow, Cheshire. He was one of six children. In adulthood he became a painter and decorator and and married Sarah Lillian North in early 1911. Lillian’s family home was Holy Cottage, The Green Muston. 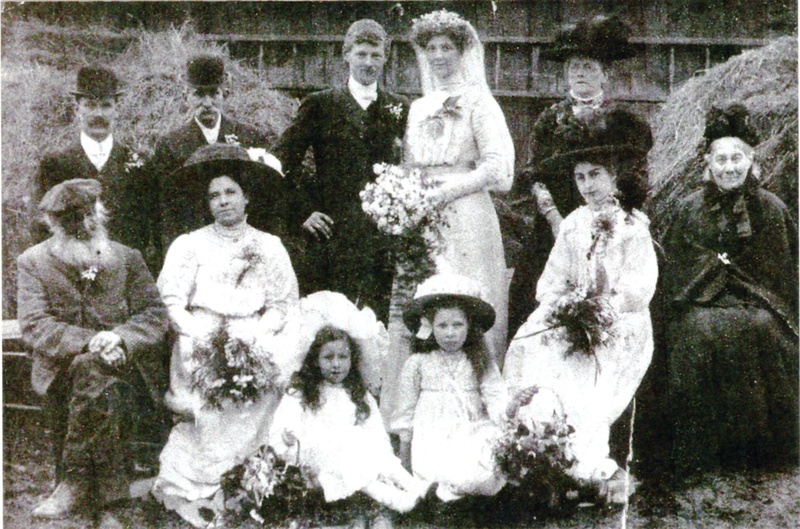 Ernest and Lily Jones emigrated to Heidelberg, Victoria, Australia sometime after 1911. Heidelberg is now a residential suburb of Melbourne. They are listed in the 1914 Australian Voting Register as living in Heidelberg. Ernest was working as a painter and decorator. Ernest Jones enlisted with the Australian Engineers, 2n d Section of the 6th Field Company on 20th July 1915 as a bricklayer. His enlistment papers also indicated he was the father of two children. 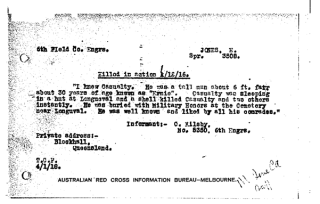 Red Cross records of his death on 1st December 1916 also sadly report that he had learned of the death of one of his children whilst serving in Egypt between December 1915 to March 1916. The impact of this tragedy shows in his service records. He is put on two charges over one week (‘committing a nuisance’ and ‘absent from parade and breaking camp’. The authorities appear to have taken account of his personal circumstances. He received minor punishment of one days detention on each charge. The 6th Field Battalion sailed from Alexandria on transport B4 ‘The City of Edinburgh’ on the 19th March 1916. Ernest arrived in France with his battalion at Marseille on the 26th March. The next day they started their transfer to northern France in the Lys Valley near Armentières. They would settle into a routine of engineering work in and out of the front line: trenching work and repair, building dugouts, surveying support lines, building stables, erecting and repairing huts, preparing gas and bomber schools, erecting observation posts, repairing drains and the army standby of painting wagons. Their sector was quIet and casualties, except for illness were light. That would change when they transferred to the Somme in late July 1916. Ernest survived that posting to the Somme. In early September he returned to Flanders near Ypres with the Battalion. Some two months later they returned to the Somme to a camp at Bernafay Wood near Longueval. They worked on repairs to the Longueval – Bazentim Road before working on deep dug-outs in the front line at Flers. There they started to take more casualties as they worked under hazardous conditions. For most of November Ernest was in hospital with influenza. He rejoined his unit on the at the end of November as they moved onto railway construction on the Decauville Railway between Quarry Siding and Longueval Circus not far from their original camp at Bernafay Wood. Ernest, alongside fifty other men from his section settled down to sleep in a large tent on the night of the 1st December. A night in a comfortable billet. Nothing remarkable is reported in the War Diary for that night. However, eye-witness accounts given in March and April 1917 from members of his section describe how at around midnight on the 1st December a high explosive shell hit ‘a large tent’ in which ‘around 50 soldiers’, were encamped in the area of the Somme near Longueval in France. Eight soldiers were injured and up to three to four others, including Ernest, were instantly killed. The Australian Red Cross Society gathered eleven eye-witness reports of this calamitous event. They tell the same story of a young man who ‘was known and liked by all his comrades’, killed by that one stray shell. His wife Sarah Lillian Jones and his surviving daughter Lillian Elizabeth Jones were still living in Australia. They are listed in pension records after Ernest’s death. Initial official correspondence to Lillian is to their Heidelberg address in Australia. However, by February 1918 Australia House in London is given as the forwarding address. Sarah and Lillian must have returned to England to be with her parents in Muston, Leicestershire. It also seems that Ernest’s elder sister Mary Ellen had also emigrated to Australia with her husband John Henry Hatton. They also lived at Myrtle Street in Heidelberg. 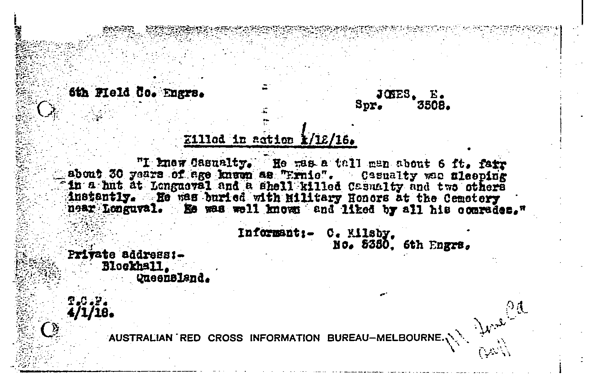 Mary Ellen wrote in July 1920 to the Australian military authorities to make request on behalf of Lillian Jones for confirmation of the ‘exact date of my brother’s enlistment’ so that she could forward a certification of his death ‘to his wife in England’. Further research is needed to find out exactly when she went to Australia. Did she follow Ernest and Lillian or had she already established her life as a married women in Australia? 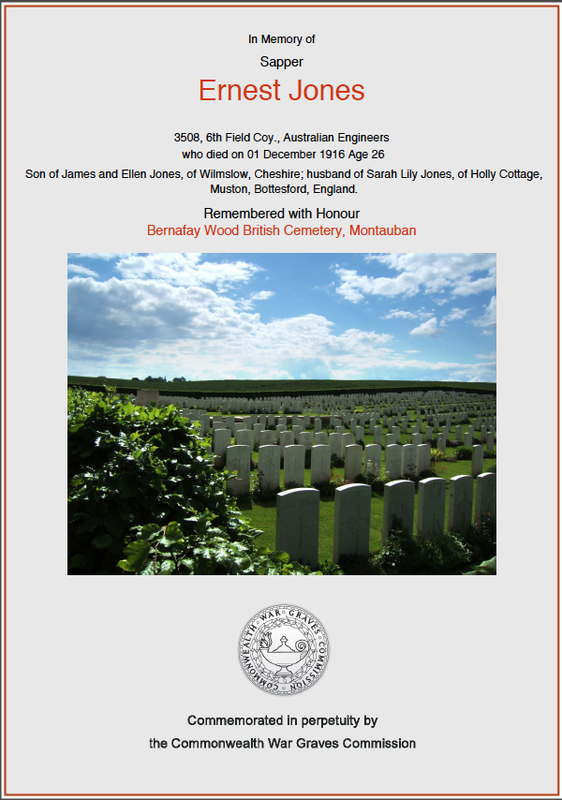 Ernest Jones was buried with full military honours at what became the Bernafay Wood British Cemetery. 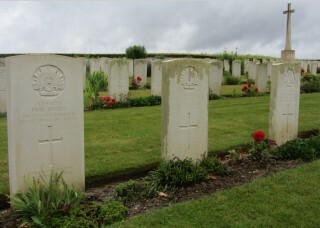 His grave lies between those of Sapper M.R Smith and Sapper W.V. Gross, the two other soldiers killed whilst they slept by the same high explosive shell.